A complete, intelligent solution to water a medium-sized garden. Genius ® 60 cart with waterproof aluminium frame, drum with strengthened cross sections and winding knob that makes winding the hose particularly convenient. 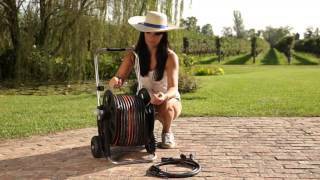 30 metres of high quality Top-Black hose, extension and connector to connect to the tap, spray nozzle with adjustable jet from fully open to concentrated, two couplings, one with Aquastop, which allows you to connect and disconnect the nozzle from the hose without having to shut off the tap. Kit with Genius® 60 offer a complete hose system equipment for gardening: hose cart -1/2” hose (30 m) mounted on reel - set of couplings and spray nozzle.